MSF project in Chiradzulu, Malawi. 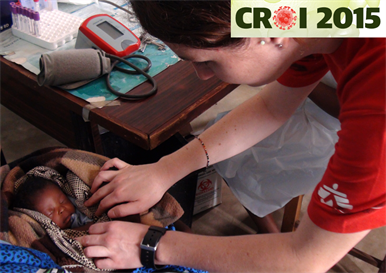 Image by Médecins sans Frontières. A large proportion of women in sub-Saharan Africa who are at high risk of transmitting HIV to their infants during breastfeeding are likely still to be undiagnosed, if results of a large three-country survey are applicable to other countries with a high prevalence of HIV among pregnant women, according to a study presented by David Maman of Médecins sans Frontières at the Conference on Retroviruses and Opportunistic Infections (CROI 2015) in Seattle, USA, on Tuesday. The study also found very high rates of HIV incidence in pregnant women aged 15-29 in Kenya and South Africa, emphasising the need for repeat testing during pregnancy and during the breastfeeding period. Despite concerted efforts to reduce vertical transmission of HIV (from mother to infant), health systems continue to face difficulties in diagnosing and treating HIV in women of childbearing age. Women may have an HIV test during antenatal care and then be lost from care before receiving their test results, or may never be tested. In addition, pregnant women who test HIV-negative during pregnancy may nevertheless acquire HIV later in the course of pregnancy, or during the breastfeeding period. To determine the extent to which breastfeeding mothers have undiagnosed HIV infection, and the degree to which these women are at high risk of transmitting HIV due to high viral load, Médecins sans Frontières conducted a three-country household survey in Kenya, Malawi and South Africa in 2012 and 2013. The study recruited women aged 15 to 59 and women were tested for HIV and asked if they were pregnant or breastfeeding. Women diagnosed with HIV received viral load and CD4 cell count testing. The study was conducted in three communities: Ndhiwa (Kenya), Chiradzulu (Malawi) and Mbolongwane/Eshowe (South Africa). Of 12,461 eligible women in these communities, 92.7% consented to take part in the study (11,550). Women were more likely to be pregnant or breastfeeding in Malawi (33.8% of 4275 participants) and Kenya (37.8% of 3760 participants) than in South Africa (12.5% of 3515 participants). Women responded to an individual questionnaire regarding antenatal care and HIV testing in antenatal care, and underwent rapid testing for HIV antibodies. Women who tested positive were tested to determine recent infection, and also received viral load and CD4 testing. Women who tested negative were tested for recent infection using a nucleic acid test, while indeterminate rapid test results were referred for confirmatory ELISA testing. A very high proportion of women had received an HIV test in antenatal care (Kenya 85%, Malawi 89.8% and South Africa 93.2%), but around one-quarter of women in Kenya and South Africa, and 17% of women in Malawi, had attended less than three antenatal visits. The study found higher HIV prevalence in South Africa (23%) and Kenya (22.2%) than in Malawi (13.4%). 4.1% of all breastfeeding women who reported a negative test during antenatal care became infected during pregnancy or breastfeeding and this was more likely to occur in Kenya (7.4%) than in South Africa (4.9%) or Malawi (2.1%). Incidence assays showed very high HIV incidence among pregnant and breastfeeding women aged 15-29 in Kenya and South Africa (3.8 and 3.2 infections per 100 person-years respectively), but much lower incidence in Malawi (0.9 per 100 person-years). Diagnosis, engagement of women with HIV in care and viral suppression were considerably better in Malawi and South Africa than in Kenya. Women were more likely to have a viral load below 1000 copies/ml (indicating a minimal risk of HIV transmission) in South Africa (63.4%) and Malawi (72.3%) than in Kenya (27.3%), and at each step of the cascade of care, from diagnosis through linkage and retention, to treatment, the countries which provided antiretroviral treatment to pregnant women had better performance. Forty-one per cent of women with HIV who were breastfeeding and undiagnosed had a viral load above 1000 copies/ml, with no significant difference between sites. Just over one third of breastfeeding women with viral load above 1000 copies/ml (37.5%) had acquired HIV during pregnancy or breastfeeding. The study authors recommended repeat HIV testing during pregnancy and breastfeeding, but David Maman concluded that although testing and initiation of antiretroviral therapy during pregnancy is essential, “Option B+ is not enough”. Treatment as prevention to bring down incidence and pre-exposure prophylaxis (PrEP) to protect women who initially test negative during pregnancy will probably be needed to eliminate maternal infection and the risk of transmission during breastfeeding. HIV testing opportunities need to follow women from antenatal clinics to child health and other settings to ensure that recent infections can be diagnosed promptly, he added. Maman D et al. Most breastfeeding women with high viral load are still undiagnosed in sub-Saharan Africa. 2015 Conference on Retroviruses and Opportunistic Infections (CROI), Seattle, USA, abstract 32, 2015.